mixer、high speed mixer、vertical cooling blender、horizontal blending & drying、plastic pulverizer、PVC plastic pellet making M/C - Chiao Wei Mechanic Co., LTD. Thank you for visiting our website! If you have interest in our products, need of technical support or quotation, please fill out the contact form. We will contact with you as soon as possible. You can also contact us with the following methods. 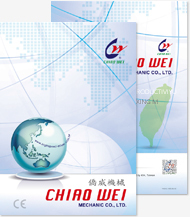 Chaio Wei machines are recognized internationally. Download the latest e-catalog to check out our high productivity machines. Expertise in mixing, grinding machines. © 2016 CHIAO WEI MECHANIC CO., LTD ALL RIGHTS RESERVED. Web design & Hosting by WeiPu.